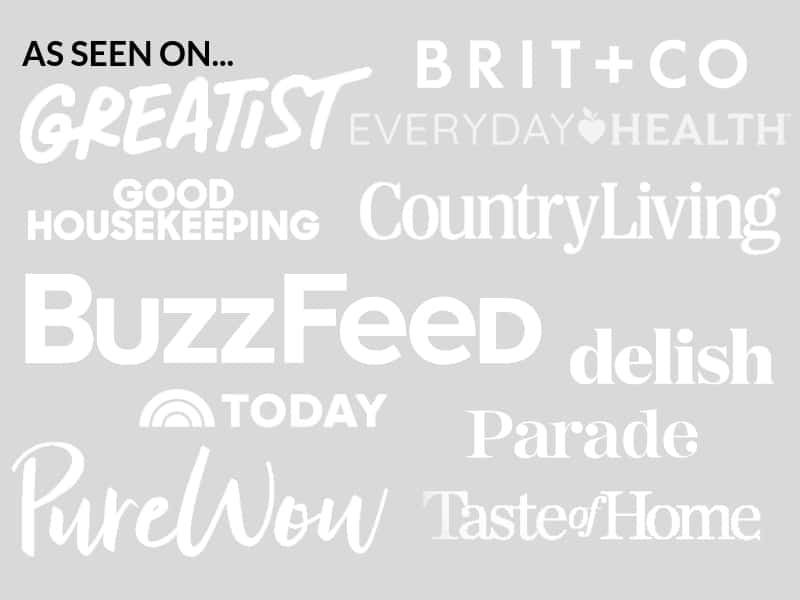 August 29, 2016 By Elizabeth Lindemann 6 Comments / This post may contain affiliate links. This is a post about steamed broccoli. But bear with me. I know it’s not the most exciting thing in the world… usually. But when it’s paired with this simple and scrumptious dip made from a mixture of soy sauce and mayonnaise, it takes the otherwise bland (but ridiculously healthy) side dish to whole new levels. I know, I know. It sounds weird. I thought so too, when one of my old roommates made this as a side to her dinner one night years ago. Then I tried it, and I’ve made it countless times since. It’s absolutely DELICIOUS, low-carb, and perfect on the side of an Asian dish (we had it with sushi from our grocery store for dinner tonight), or simple seared steak, chicken, or fish. The mayo soy sauce dip is SO GOOD. It’s salty, creamy, and packed with that awesome umami flavor you get from soy sauce. 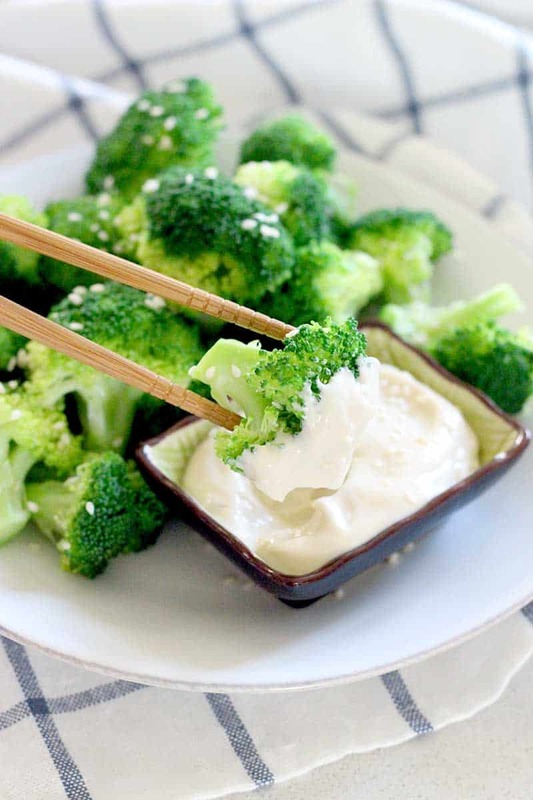 No need to do anything to the broccoli- not even salt and pepper. The dipping sauce packs such a flavor punch that no other seasoning is necessary, making this a ridiculously easy side dish to whip up any time. Everything takes a mere 5 minutes from start to finish! I recommend making some extra sauce to slather on sandwiches or wraps. You’ll want to make sure to not cook the broccoli too much. It’s easy to overcook the broccoli when steaming it on the stove- no more than 2-3 minutes is necessary to achieve crisp-tender perfection. When it turns a bright, beautiful green color, you’ll know it’s done. You probably don’t even need an official recipe for this one since it’s so easy, but here are the instructions for you anyway :-) Enjoy! 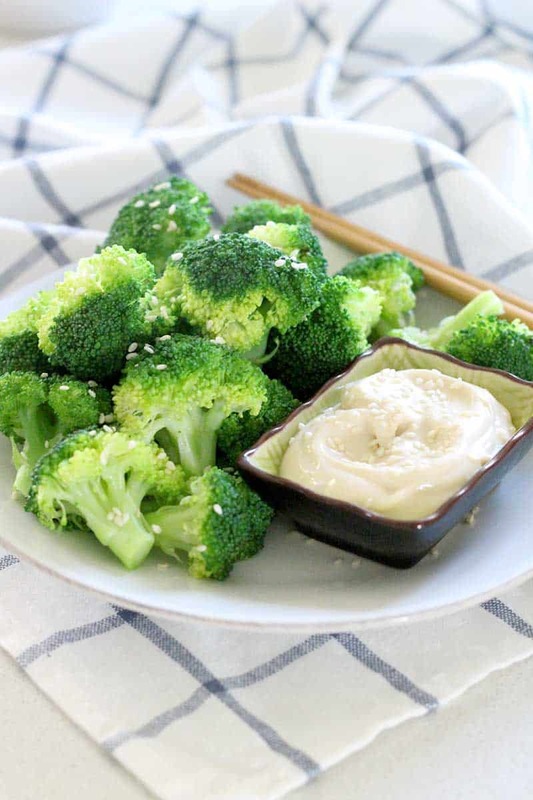 Steamed broccoli is anything but boring when paired with this DELICIOUS dip made from mayonnaise and soy sauce. An awesome low-carb side! Meanwhile, mix together the soy sauce and mayonnaise. 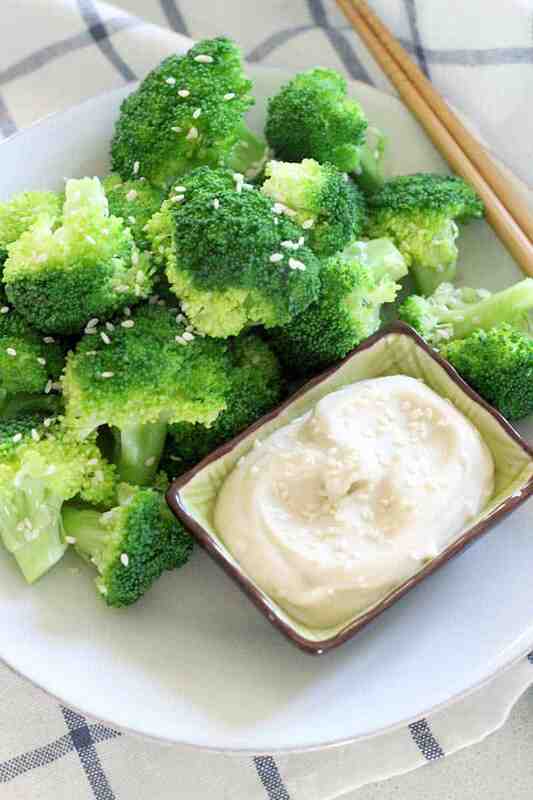 Serve the broccoli with the sauce and garnish with sesame seeds, if desired. OMG that sounds SO good! Thanks for the tip! I wish I had known about it earlier! I loveeee how delicious it is, with only two ingredients. 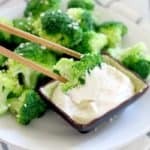 I’ve known of and have promoted this hidden gem of a dip for this specific and other purposes since 1984 when a friends’ mom first served it with broccoli. It is delicious on just about anything.